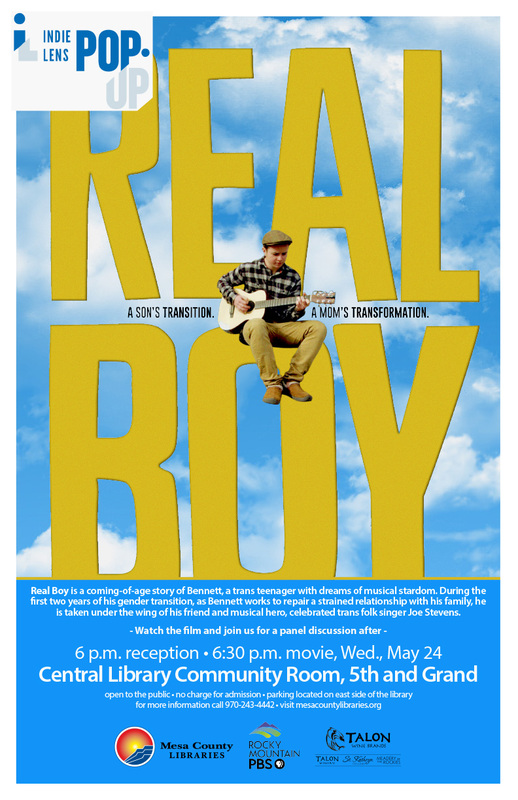 Join us at 6 p.m. Wednesday, May 24, for a screening of “Real Boy,” the next film in the Indie Lens Pop-Up Film Series. The screening takes place at the Mesa County Libraries Central Library Community Room, 443 N. 6th St. in Grand Junction. An opening reception begins at 6 p.m., with the film starting at 6:30 p.m. It is open to the public at no charge. Seating is limited. “Real Boy” follows the journey of trans teen Bennett as he navigates adolescence, sobriety, and the physical and emotional ramifications of his changing gender identity. Through the process, his mother Suzy makes her own transformation – traveling the difficult road toward accepting that the daughter she raised as Rachael is now her son Bennett. Through observational storytelling that is alternately heartbreaking and humorous, “Real Boy” offers a clear-eyed look at a family tested by a change they never imagined; the complexity of addiction; the healing power of music; and the unbreakable bond between mother and child. “Real Boy” is a love story about a mother and son who rediscover connection with each other and find support from their communities, reminding us that families are not only given; they can also be chosen. You can find more information and a film trailer for “Real Boy” here. The Indie Lens Pop-Up Film Series is co-sponsored by Mesa County Libraries, Rocky Mountain PBS, and Talon Wine Brands.